This beautiful sub-species of clouded leopard was three to five feet in length and weighed 35 to 50 pounds. Native to the island of Taiwan it lived mostly in forests of a thousand feet or more above sea level. Spending much of its time in the trees, it hunted monkeys, birds, squirells, and deer. Its average lifespan was about 11 years. It was a secretive animal, avoiding human contact. It had a keen sense of sight, smell and hearing. Little is known of their social systems but males and females probably only met for breeding. The females had an average of two kits who were weaned at 10 weeks and were independent in 10 months. 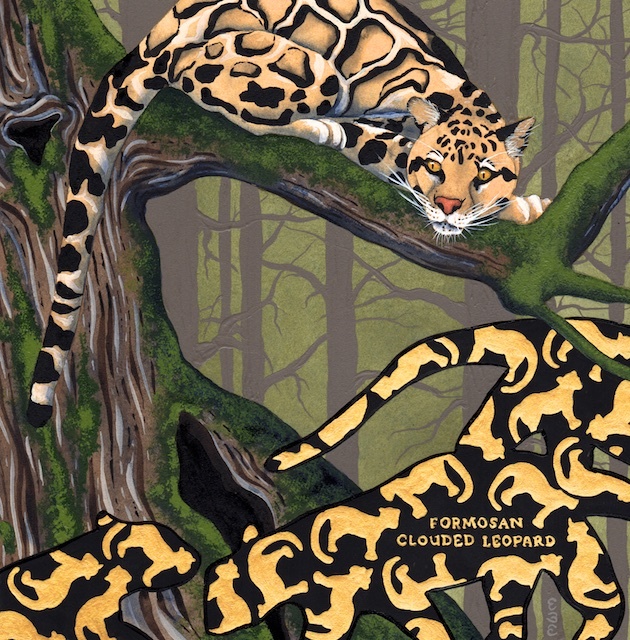 The beauty of the Formosan clouded leopard was a primary reason for its demise. Its gorgeous coat was sought by poachers for its value and the leopard’s bones were used in traditional Chinese medicine. The loss of habitat due to deforestation was also a factor. A 13 year search for the cat was mounted in 2000 and after the use of 1,500 infrared cameras, hundreds of catnip-bated hair traps and field hours beyond number, no cloud leopard was to be found in Taiwan. Other subspecies of clouded leopard found in Southeast Asia to the eastern Himalayas are all at risk. Deforestation and poaching have the potential to drive them all to extinction.